The pond in my back yard is frozen, all the leaves have fallen off the trees and the snow blower is ready. These are all signs that Minnesota is firmly in the act of becoming the ice planet Hoth, as history suggests. Happily, my transition into winter has been cushioned. I have some fine products to test, most notably the Halo Glove and Halo Overshoe, from Sealskinz. While I have written about the Halo Glove, learn about my first impression of their Overshoe for winter biking. 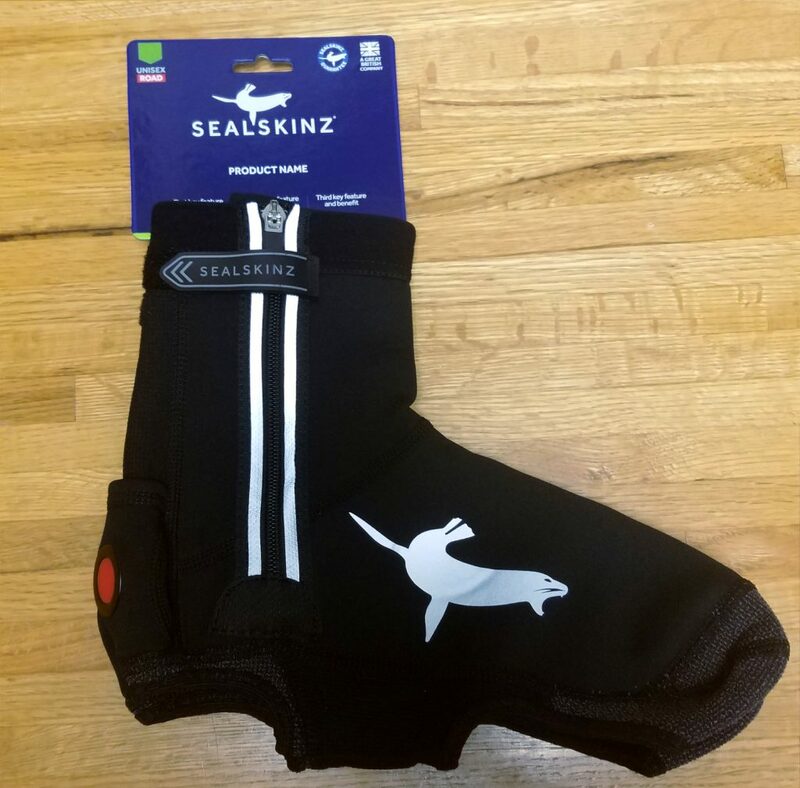 Sealskinz has made every effort to keep their products as waterproof as possible, including the packaging. The Overshoes came to me on a cardboard backer and was held in place with paper bands. In short, the Halo’s Overshoe construction is as impressive as its packaging. All the seams are in the product are welded (so no stitching). Plus, tape is bonded to the backside of all the seams to ensure they stay waterproof. The closure uses a zipper with large teeth so they operate under pressure. 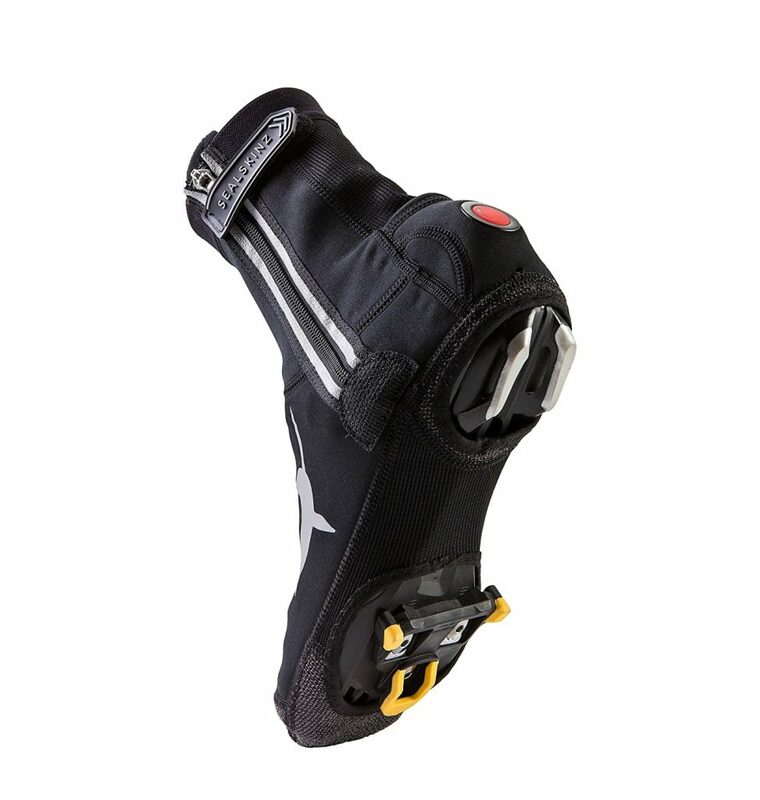 Then at the top of the zipper a large rubberized Velcro strap keeps everything tight. Also, the toe and heel are reinforced with a Kevlar fabric for durability. Finally, the most unique feature of the Halo Overshoe is its LED light mounted in the heel for visibility up to 500m away. Packaging for the Halo Overshoe is neat and ensures the bootie stays waterproof. Trying the overshoes, my first time was a bit of a challenge. They fit snug and I had issues getting them to zip up due to where my shoes buckle was located. However, I am happy to say that was a onetime experience. I am not sure if the overshoes stretched, or what since that first time? Now, the overshoes fit on with ease and the zipper hasn’t offered any resistance. The fit is great as they are snug without being too tight. Not like many overshoes for bikes that often suffer from the toes flipping up due to a bad fit. While the Halo Overshoe stays put perfectly. So far, I have ridden with the Halo Overshoe in conditions ranging from 30’s and raining down to windy at 11 degrees. Through all that weather I can happily say the Halo Overshoe has kept my feet warm and toasty. Even with the large holes in the bottom of the overshoe for the heel lugs and cleat, all the other waterproofing features kept my feet dry. The great thing about the overshoes LEDs is that, while blinking they are also moving up and down as you pedal. This gives them a unique appearance that is virtually impossible for drivers to miss. On top of the LEDs active visibility the Halo’s also have reflective material applied on the side, cuff and along the zipper. The red LED lights are also easy to activated by pressing on them. As the weather continues to get colder, I plan to see just how low a temperature I can go with the Halo Overshoes. As I mentioned above, so far I have had good success down to 11 degrees with wool cycling socks, standard cycling shoes, and the Overshoe. 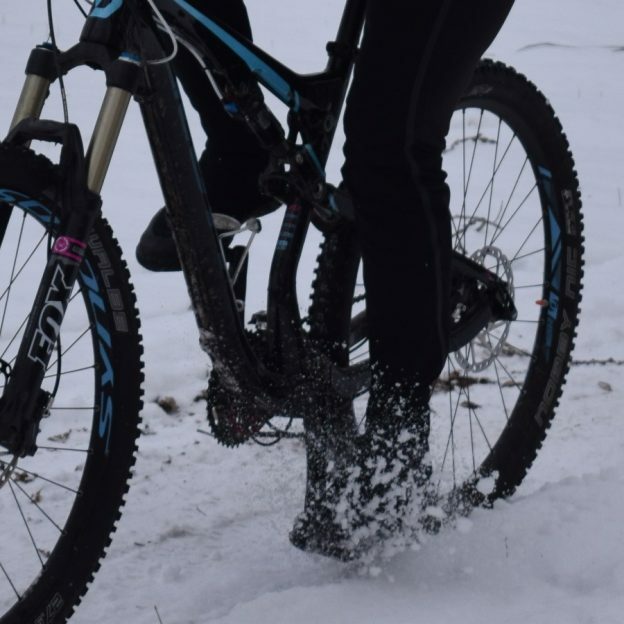 Moving forward, I plan to use the Halo Overshoes in combination with Sealskinz Superlight sock to see if I can be comfortable into single digits, Stay tuned for more info. This entry was posted in News and tagged biking visibility, cold feet, Cycling Booties, Cycling overshoes, Cycling shoes, cycling visibility, Minnesota Bike Guide, MORC, Mountain Biking, mountain biking fun, sealskinz, sealskinz bootie, sealskinz halo, sealskinz halo bootie, sealskinz halo overshoe, visibility, warm bike clothing, Winter cycling, winter riding on November 16, 2017 by John Brown.